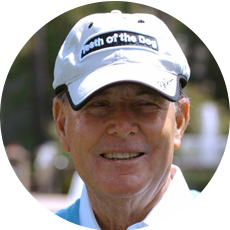 Pete Dye has done much to change the face of golf since leaving the business world in 1959 to undertake a career in golf course architecture. 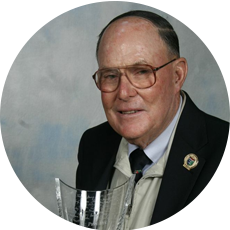 A fine golfer in his own right, Dye played in five U.S. Amateurs, one British Amateur, one U.S. Open as well as several other significant amateur tournaments. With more than 100 courses to his credit, many of which have hosted numerous PGA TOUR and LPGA events, major championships, a Ryder Cup and a Solheim Cup. Born in Urbana, Ohio in 1925, Dye served in the Army in World War II. After the war he attended Rollins College in Florida, where he met his wife, Alice. After building a few courses in the Midwest in the early 60s, Dye and his wife traveled to Scotland in 1963 and spent a month studying and playing many of the world’s classic layouts. What he took away changed the shape of golf design in the later part of the 20th century – bunkers of all shapes and sizes, including small pot bunkers and large irregular shaped waste bunkers, railroad ties as architectural features, unmanicured rough and a general orientation to a more strategic approach to the game. With this Scottish epiphany, Dye set out to build some of the most transformative golf courses, first in the United States and then around the world, adapting his designs to incorporate the design features of great Scottish courses to modern golf course architecture. The first course that reflected this new approach was Crooked Stick in Indianapolis, Indiana; The Golf Club in Columbus, Ohio followed and opened in 1967. The big breakthrough, however, was Harbour Town Golf Links on Hilton Head Island, which he designed along with Jack Nicklaus. The course, originally measuring a little more than 6,600 yards, stressed a less power oriented approach to the game by emphasizing hitting to specific areas of a particular hole, rather than a reliance on brute force. In the early 1980s, along with the encouragement of then PGA TOUR Commissioner Deane Beman, Dye built what was to be his crowning achievement, the TPC at Sawgrass. With the liberal use of large waste areas, greenside pot bunkers and putting surfaces designed to repel improperly struck shots, the course enjoyed much positive critical acclaim from the very beginning. But the most distinctive and memorable feature of the course is the island green on the short par-3 seventeenth hole. Not only is it one of the most challenging holes in all of golf, it is clearly one of the most memorable and entertaining. Has designed more than 100 courses in North America, the Dominican Republic, Israel, and Switzerland. Dye has modified his approach through the years as advances in golf equipment have changed the game. His designs at PGA West (the Stadium Course), the wind-swept ocean course at Kiawah Island and Whistling Straits are testament to his flexibility, while adhering to the design fundamentals he developed and nurtured. Dye’s approach to constructing a new course harkens back to an older time – he does not strictly adhere to detailed architectural plans or diagrams, preferring instead to fashion each hole out of the ground in a very personal and hands-on fashion, very much in the manner of the grand masters of golf course architecture. Given Dye’s approach, you’d almost expect to see him out on a job site with the mules and scrappers fashioning a course similar to his direct lineal architectural antecedents – Donald Ross, C.B. Macdonald, Alister MacKenzie and A.W. Tillinghast. Fittingly, one of his newest designs, French Lick in Indiana, is right next to one by Donald Ross. The old adage – the more things change, the more they remain the same – is appropriate here when one views the two courses side-by-side, as both are examples of the very best in golf design.With his induction, Dye rightfully takes his place among the best in the game.